Humanity is closer to a nuclear Armageddon than at any time in the last 60 years, at least according to a group of atomic scientists that monitor the existential threats our species faces. In fact, ever since 1947, a distinguished panel of astrophysicists has been calibrating a device known as the Doomsday Clock, which represents their consensus about the chances that mankind will be destroyed by weapons of mass destruction, climate change or other catastrophes. Recently, they reset their clock to “two minutes to midnight,” which indicates their assessment that the risk of a nuclear conflagration are as high as any time since the height of the Cold War. North Korea has accelerated a program developing and testing nuclear-tipped missiles that could hit the territorial United States. The United States is on the verge of exiting a nuclear non-proliferation deal with Iran. Cyberwarfare is sowing mistrust in society while escalating the chances that the computer systems that control atomic energy facilities or nuclear weapons could be hacked or compromised. Other dangers, of course, include the possibility that terrorists could detonate dirty bombs or a nuclear suitcase in a major city. Do you live near a nuclear power plant or a major metropolitan city? If there is a nuclear meltdown (or a blast), it’s virtually certain that authorities will order residents with a ten-mile radius of the incident to either hunker down in their homes or evacuate the area entirely. However, more than 150 million Americans live within 50 miles of a nuclear reactor, which may be too close for comfort, too, in the event of a catastrophic incident. For instance, the last big meltdown happened at the Fukushima plant in Japan in 2011. At the time, atomic experts in the U.S urged any American citizens in the country to seek safety outside a 50-mile radius from the nuclear incident. That’s because winds can carry radioactive plumes dozens of miles from an accident or blast, which can contaminate drinking water, crops and the landscape too. Planning possible escape routes well ahead of time could be key to getting out of harm’s way. But experts caution that people should expect that major highways will be congested as other residents attempt to flee. Therefore, considering several alternative routes is advisable. You should also be prepared to consider multiple means of transportation (such as boats, all-terrain vehicles and hiking) depending on your location and the circumstances. Should you hunker down or flee? That decision will depend on many factors including how much advance warning you have, instructions from the authorities and which way the wind is blowing. However, you should have disaster plans for both contingencies. Tools that can help you stay informed and make decisions include a transistor radio with fresh batteries so that you can listen to public service announcements. Don’t just rely on your cell phone as service could be interrupted by overwhelming user volume. In addition, a device like a Kearny Fallout Meter can help give you an advanced warning of radioactive contamination. Experts also recommend having a survival pack on hand for each member of your family. Items that should be included in each pack include tinned food and bottled water for at least three days, flashlight (and extra batteries), first aid kit, compass/maps, extra clothing, dust mask, moist towelettes and portable phone charger. Scientists also say that potassium iodide tablets can help protect against radiation sickness and thyroid cancer caused by fallout. These pills are highly recommended for infants, pregnant women and people under 40, but they should only be taken when advised to do so by health officials. Many experts contend that a mixture of baking soda and water can help remove nuclear contaminants from your skin, food and other surfaces. That’s because baking soda absorbs radioactive isotopes. 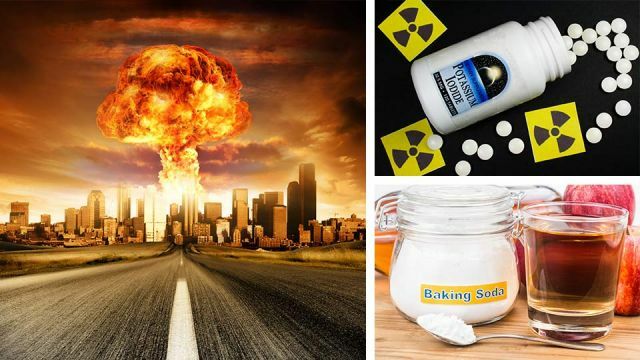 To make your own fallout survival recipe, mix one cup of water (or apple cider vinegar) to one cup of baking soda to produce a rinse that can help cleanse radioactive dust from your skin or food. You can even drink this liquid to help eliminate radioactive contaminants from your stomach lining. If evacuation is not feasible (or if the authorities recommend hunkering down), then finding a secure location may be your best option. Experts suggest you should seek shelter in a concrete structure (particularly a basement). According to the CDC, you should shut all windows, doors and ventilation systems. If you believe you were exposed to radioactive fallout, then you should remove all outer layers of clothing and take a warm shower. It is also recommended that you tune in to emergency broadcasts so that you can stay abreast of health and safety recommendations from the authorities. There’s only so much you can do to stay safe in the event of a nuclear incident. But planning ahead could well be the difference between life and death.